WAHPSA welcomes you to attend our annual Networking Breakfast. A light, healthy breakfast will be provided on arrival, be prepared to network! Gina is part of the Health Promotion and Education Research team with the Telethon Kids Institute. Her area of research expertise is children’s physical activity & the built environment, children’s active transportation, the influence of the neighbourhood food environment on eating behaviour, childhood obesity & nutrition. 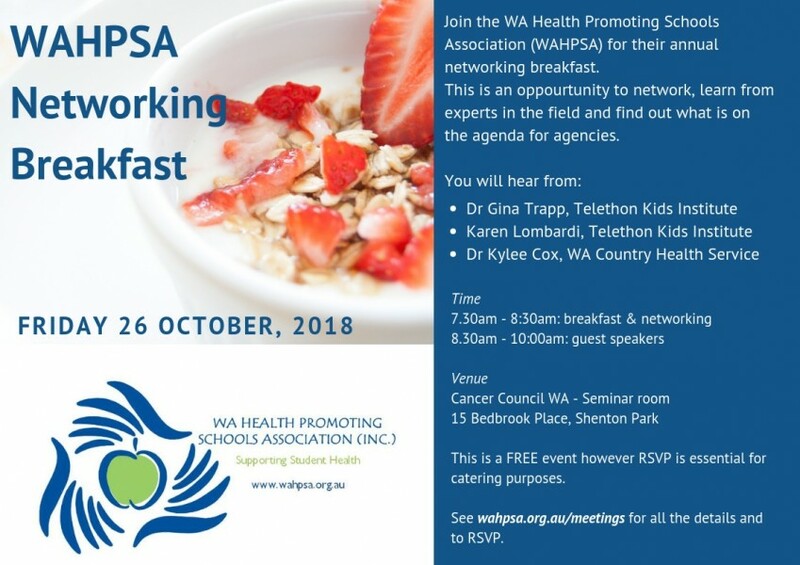 Gina will be presenting on the Healthway funded research undertaken at TKI looking into obesogenic food environments around Perth schools as well as an outdoor food advertising study being conducted by students at Edith Cowan University. Karen is a current PhD Candidate and Research assistant with the Child Health Promotion Research Centre at Edith Cowan University. Karen will be presenting on the Talk Early Talk Often project which is developing resources to support communication between parents and their Year 7 children about alcohol and cybersafety. The project aims to reduce the risk of harm to teenagers in the online environment with regards to alcohol use. The resources and information will be made available to parents of Year 7 students through their child’s school. The resources will be developed in 2018 and trialled in 2019. The program will comprise a Family Event held at the child’s school and online information for parents. Kylee is a dietitian and public health nutritionist who has worked in country health services for the past 25 years. Her PhD research examined breastfeeding determinants for country women and she currently works for the WA Country Health Service supporting community health programs for children, young people and their families in country WA. Kylee has recently been involved in a joint review of health services for school aged children across WA and will be presenting an overview of the Review findings and recommendations.